This Getting Started Guide for Teachers will provide students with a quick overview of the functionality available to them through Sadlier Connect. The products shown on the screens will vary depending on the products that your school has purchased and assigned to you. You should have received a Welcome email with your account information and your school specific URL to access your digital products. The welcome email also contains your username and password. You should not share this email or the information contained in it with others. Your screen should look like the screenshot on the previous page. The difference is where you see “Sadlier School of Learning” you should see your school’s name. If you do not see your school's name or know your school specific URL see your teacher for that information. You will enter your username and password in the field provided and then select the “Log In” button to login and access your assignments and materials. If you forget your password, you may use the “Forgot Password?” link below password entry field on the “Log In” screen. You will need to have access to the email account associated with your teacher account. It should be the email address you use for school. 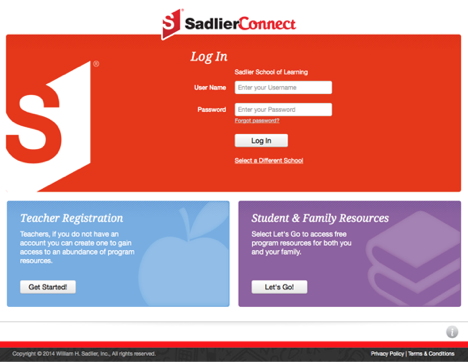 Upon logging into Sadlier Connect, you will be brought to the “Teacher Bookshelf”. The teacher bookshelf is where you will find all the products you have access. At the top center of the screen, you should see your name. If you do not see your name, please contact your technology coordinator at your school for assistance. You can always get back to your bookshelf by selecting the white books icon that is below the Sadlier Connect logo. The bookshelf is your launch pad into the products you have access. When you select a product icon on your bookshelf, you will be taken to the resources available to you for the selected product. You can customize your bookshelf by marking products you need to use as your “Favorites”. To mark a product as your “Favorite” just select the star to the right of the product image. You should see a gold star to the right of the product. Select the start to unmark it as one of your favorite products. You can then change the “Filter”, which products controls the products displayed on your bookshelf and dashboard. Place checkmark in “Favorites” then de-select the other filter criteria to display only your “Favorite” products. The “Filter” is the tab to the left on your bookshelf and dashboard product selectors. You can edit your account information by selecting “My Account”. This feature allows you to update information like your username, password, and email address. Product Preferences allows you to make products not visible to your account if you do not wish to use them. You may not hide products for which you have made assignments to your students. 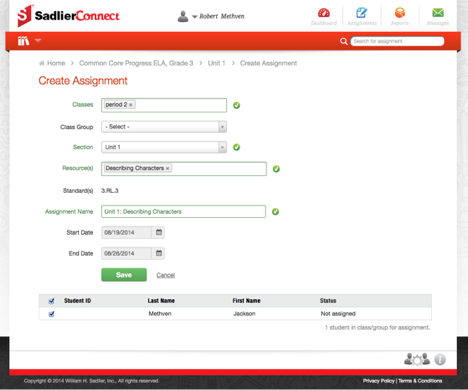 Sadlier Connect will help alert you when students or a significant part of the class is struggling on a particular standard. You have the ability to adjust how these warnings will work based on your preferences. You configure your alert preferences through "Account Settings" on the menu at the icon to the left of your name. You determine the types of assessments that you would like alerts to be triggered as well as the minimum number of questions asked per standard. 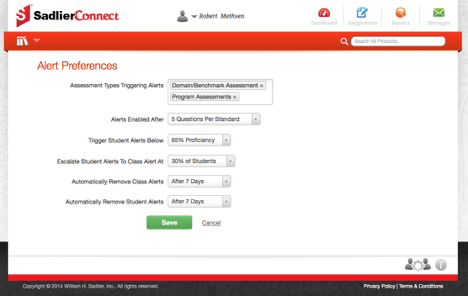 The other settings tune your proficiency levels and when student alerts escalate to a class alert. Located in the upper right-hand corner, you will find your main navigation items. The “Dashboard” icon will take you to your “Teacher Dashboard”. 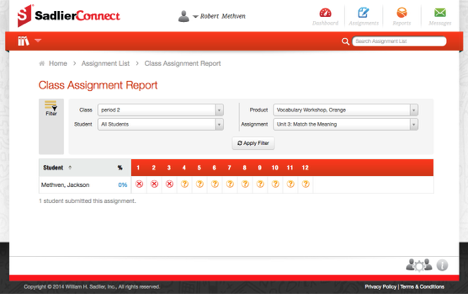 “Assignments” takes you to the list of the assignments you have created for your class. You can adjust the assignment list by using the filter to display only open, pending, graded, or to-be-graded assignments. “Reports” will provide you access to a variety of reports that you can run to see how your students are progressing through the product materials. “Messages” is a Sadlier Connect messaging system that if used can be used by teachers to communicate with students and their parents. Students cannot interact with other students. Teachers can only interact with students that are in one of their classes. Your school administrator can turn off the messaging feature. Down in the lower right-hand corner of the screen is where you will find your class management related features. Including the ability to “Manage Students” and “Create Classes”. 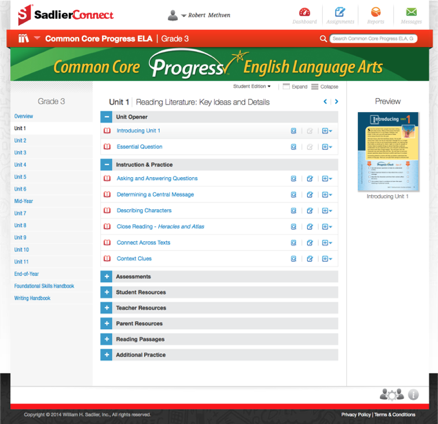 The icon to the right of “Class Management” icon is the knowledge base and support center for using Sadlier Connect. Here you will find articles that detail how to setup classes, manage students and other functionality of the system. One can access their product resources from the “Teacher Bookshelf”. Just select the product from the bookshelf that you would like to access. You will then brought to the “Product Resources” from which you will be able to select resources you want to use in the classroom. Also, you can create assignments for your students from these resources. The resources available for the products do vary across programs. The digital products and therefore resources available to you are controlled by what products your school purchased. You can find online student edition eBooks, online teacher edition eBooks, assessments, games, multi-media resources including audio and video. All of the resources for a particular program available at your fingertips simply by selecting the product icon from your bookshelf. Once you are comfortable using one product, you will be able to comfortable use any other products on Sadlier Connect. While the structure and resources available will vary, the navigation and functionality will remain the same. In the red, bar you will see your product name on any screen from which you are accessing resources for that product. Followed by the product specific branding bar. The main functionally is controlled by the three panels below the product specific branding bar. On the left side of the screen, you will find your product navigator. The information contained in this section is product specific and will vary across products. One can select any of the navigation links that form the overall structure of the program to access the materials for that unit or chapter. The resources are grouped using categories to make it easy for you to locate the resources you need. The resources are available for the selected unit display in the middle panel of the screen. Selecting the resource name will view the actual resource. The preview icon, the first of the three icons, will update the preview pane to provide you with some information about the resource. Information contained in the preview pane will be a thumbnail of the resource, the name, as well as the correlations for that resource to state or national standards. To create an assignment from the "Product Resources" page, select the assignment icon that is the image in the middle fo the actions icons. You will select the class or classes that you would like to create the assignment. The rest of the information will be pre-populated for you based on the resource that you selected. The assignment name, as well as the start and end date, can be changed by you. The end date will default to 7-days from the start date are changeable. All of the students for the class selected will display at the bottom of the screen and default to getting the assignment. If you do not want a student to get, the assignment just unmark the checkbox to the left of their name. One can also setup groups within your class then make assignments a group of students. With resources that can be completed online by students, you have the option of scrambling the order of the questions. One can do this by selecting the checkbox to the left of the "Scramble Questions" option. You can get to all of the assignments you have created by selecting “Assignments” icon in the main navigation bar. If you have an assignment that requires you to grade all or part of the assignment, you will see a badge indicating how many assignments need to be graded. You can grade these assignments from the “Assignment List”. 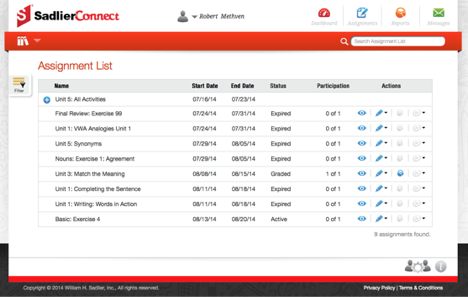 Contains a list of all the assignments you have created for your students. The display can be sorted by clicking on the column headers. You can see the name of the assignment, its start and end date, the status, as well as how many students have completed the assignment as well as number of students it was assigned. You can use the “Filter” on the left side of the screen to apply filters to your assignment list to make it more manageable. There are actions available for assignments. These are the icons in the last column of the “Assignment List” table. You can view the resource, modify the assignment, access a class assignment report, or grade the assignment if it requires a teacher to grade the assignment. The system will auto-grade assignments when possible. The "Grade Assignments" is disabled unless the resource needs a teacher to grade it. Once the first student starts to take an assignment, you will not be able to delete it. One can re-assign an assignment after it has been once the students complete the assignment. You have the flexibility to re-assign to an entire class, a group of students, or an individual student. Extending assignments can be done selecting the edit assignment icon. 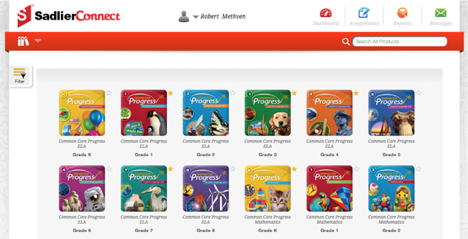 Sadlier Connect contains a variety of reports for you to track the progress and performance of your students. Many of the reports allow you to drill-down into additional levels of details. All of the reports screens have a “Filter” section displayed at the top of the report. Some reports will require this to be filled out before you will see any data. You must select the “Apply Filter” button for the filter to take effect. One can get additional information by interacting with the report. In the example above the user can select the icons in the report to information about student answers and the distribution of the responses. Selecting the a percentage number to the right of the name will show you the detail of how the student answered the assignment.